Institute for National Security Studies presents plan which creates 'Palestinian' state - with or without Palestinian Authority's consent. Israel's Institute for National Security Studies (INSS) is presenting a new "peace plan." For the past two years, the Institute has worked with all those who were involved in previous Israeli-Arab negotiations. A Channel 2 report said former IDF Chiefs of Staff Benny Gantz and Gabi Ashkenazi were involved, and that the plan has already been presented to Arab leaders, as well as to the White House and Israeli Prime Minister Binyamin Netanyahu. Under the plan, Israel would use the security fence as a separation line, and redivide Judea and Samaria. Sixty-five percent of Judea and Samaria would be allocated for a "Palestinian" state, and the rest - including the settlement blocs and Jerusalem's Jewish neighborhoods - would remain in Israeli hands and building there would be unobstructed. Building in more isolated settlements would be frozen, in order to allow for future negotiations. The Jordan Valley would remain under Israeli security control, and the IDF would retain operational freedom in Judea and Samaria. No towns would be evacuated at this point, and Israel would push the international community to bolster the Palestinian Authority's (PA) economy. At this point, Jerusalem and Gaza would not be on the table, and the Palestinian Authority's agreement is not required. If the PA does not agree, Israel will push the plan forward on its own, with international backing. 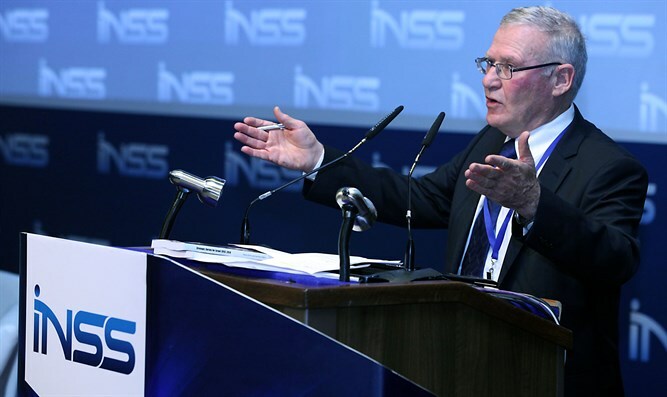 According to INSS Director Amos Yadlin said, this is the only plan which could succeed and Israel will almost certainly adopt it after the elections next year. "The State of Israel doesn't have a diplomatic Waze, and we're offering it a diplomatic Waze," he said. "We're suggesting it take a regional path, we're suggesting it take an independent path." "We can move...between roads, according to developments, but the important thing is that you know which destination you set. Our Waze is set to a Jewish country, a democratic country, a safe country, and a moral country. "We need to shape our country. If they can make a Palestinian state which can live in peace next to us, I'm in favor of that, I'm really in favor of it. But I am not going to condition it on their agreement. I'm willing to take a chance and tell you...that after the midterm elections, and after the Israeli elections in 2019, this will be the plan that a responsible Israeli leader will take and implement."